The MycoLight™ Live Bacteria Fluorescence Imaging Kit provides an easy and convenient way for visualizing live bacteria through fluorescent microscope. MycoLight™ 520 is non-fluorescent esterase substrate that diffuse into both Gram positive and Gram-negative bacteria. Upon hydrolysis by bacterial intracellular non-specific esterase, a green fluorescent product is produced and accumulated within bacteria. Compare to the commonly used esterase substrate CFDA and CFDA-AM, the kit provides brighter and more stable signal with lower background and easier staining protocol. Prepare 100X dye stock solution. Add MycoLight™ 520 and Signal Enhancer. Incubate bacteria samples with MycoLight™ 520 and Signal Enhancer at 37°C for 5-10 minutes or room temperature for 60 minutes in dark. Analyze sample by fluorescence microscope with FITC filter sets. Thaw one of each kit component at room temperature before starting the experiment. Unless otherwise noted, all unused stock solutions should be divided into single-use aliquots and stored at -20 °C after preparation. Avoid repeated freeze-thaw cycles. Add 100 mL of DMSO (Component D) into the vial of MycoLight™ 520 (Component A) to make 100X stock solution. Prepare bacteria sample with concentration in range of 106 to 108 cells/ml. Grow bacteria into late log phase in appropriate medium. Remove medium by centrifugation at 10,000 x g for 10 minutes and re-suspend the pellet in Assay Buffer (Component B). Note: Measure the optical density of the bacterial culture at wavelength = 600 nm (OD600) to determine the cell number. For E. coli culture, OD600 = 1.0 equals 8 x 108 cells/ml. Treat cells with test compounds as desired. Remove treatments by centrifugation at 10,000 x g for 10 minutes and re-suspend the pellet in appropriate amount of Assay buffer (Component B) so the concentration of bacteria in the treated sample is the same as the live. Note: Determine the concentration of the bacterial culture before starting the treatment. Note: Dead bacteria can serve as negative control, it is recommended to kill bacteria with 70% ethanol for 30 min followed by 60 min of boiling. Add 1 µL of the 100X MycoLight™ 520 stock solution and 10 µL of 10X Signal Enhancer (Component B) to 90 µL of the bacterial sample in Assay Buffer. Mix well and incubate in dark for 5-10 min at 37°C or 60 min at RT for optimum staining results. Monitor fluorescence of bacteria with a fluorescent microscope through FITC (Ex/Em = 488/530 nm) channel. Note: Same protocol can also be used for microplate reader assays. Figure 1. Fluorescence images of E.coli stained with CFDA or MycoLight™ Live Bacteria Fluorescence Imaging Kit. CFDA requires washing steps before imaging to minimize background, while no washing is needed using this kit Cat#22409. 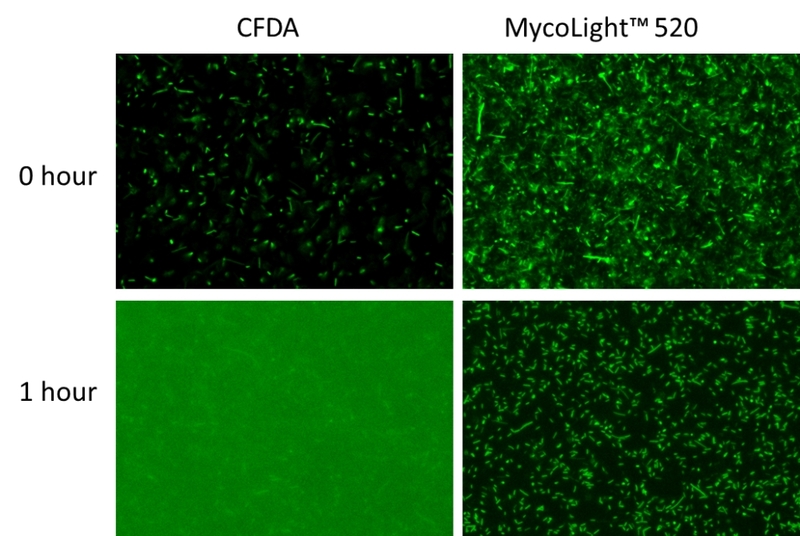 The staining efficiency of Mycolight™ 520 is much higher than CFDA as more bacteria show green fluorescence. The signal of MycoLight™ 520 remains in cells after 1 hour of staining while CFDA leaks out readily. Same amount of bacteria were presented in each sample and fluorescence images were taken under the same exposure time. Authors: Myintzu Hlaing, M.; Wood, B.; McNaughton, D.; Ying, D.; Augustin, M. A. Authors: Zeidan-Chulia, F.; Keskin, M.; Kononen, E.; Uitto, V. J.; Soderling, E.; Moreira, J. C.; Gursoy, U. K.
Authors: Shi, C.; Jia, Z.; Chen, Y.; Yang, M.; Liu, X.; Sun, Y.; Zheng, Z.; Zhang, X.; Song, K.; Cui, L.; Baloch, A. B.; Xia, X. Authors: Booyens, J.; Thantsha, M. S.
Authors: Cai, P.; Huang, Q.; Walker, S. L.
Authors: De Lamo-Castellvi, S.; Toledo, R.; Frank, J. F.
Authors: Nocker, A.; Fernandez, P. S.; Montijn, R.; Schuren, F.
Authors: Sawaya, K.; Kaneko, N.; Fukushi, K.; Yaguchi, J. Authors: Alleron, L.; Merlet, N.; Lacombe, C.; Frere, J.